We have adequately outfitted and trained roof cleaners who will use highly effective pressure washing gear to eliminate lichen, mould, algae, streaky stains and moss from roofs. House roof cleaning is important if you want your property to look good, and is also important simply because certain dangerous growths can in fact “eat” and harm your roof if left neglected for very long. Our service is fully insured and at a great price! For assistance with cleaning your roof & gutters, bear in mind to book our general window cleaning service right now! Ourwindow cleaning service is deep cleaning of windows, using purified water and fed pole cleaning method for external window cleaning and squeegee for internal window cleaning. 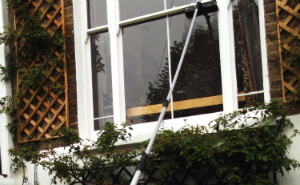 The deep and thorough Bushy Park TW12 domestic window cleaning service involves not only secured window cleaning, but also cleaning of almost all frames, if PVC, wiping of all sills, if reachable, also. We promise fast result and insurance in case of any omission. Key pick-up and delivery can be arranged, in case you have no chance to remain in the property throughout the treatment. Almost all type of domestic properties are accepted. Proper gutter cleaning must be done at least once a year to avoid clogging of the downpipes and gutters. Ashlee House Cleaning can provide you with efficient and top-quality gutter cleaning. The gutter cleaners are ready to use the professional dry or wet vacuum cleaners and telescopic poles to reach to any dirt. Small cameras mounted on the poles' end allow the cleaners to see and remove all leaves, twigs and other residues. You will be given before and after pictures of the condition of your gutter and downpipes. We offer our clients a quality guarantee of 1 month for the service. We have a really effective system for service reservations. Our customer support staff is available 24-7 to process your requests. Simply just call 020 3746 1366 or send us an booking form. Throughout the following 2 hours you will be sent an e-mail verification for your reservation. Our professional window cleaners will clean up with no need of ladders and without hanging out into your windows if you are up to the 4th floor. Our services come at acceptable prices, with no concealed fees. Book more than A single service and you will spend less both time and money. There are special offers for those who book earlier, for our frequent customers, as well as for nearby real estate companies and property admins. And so, if you really want your windows thoroughly cleaned - get our window cleaning Bushy Park TW12 service at this moment!